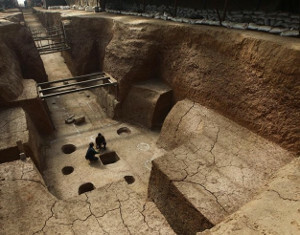 Chinese archaeologists recently completed their work excavating an ancient tomb located near Luoyang (洛阳), Henan Province (河南省), according to recent reports in the Chinese press. The archaeologists from the Luoyang Municipal Institute of Cultural Relics and Artifacts (洛阳市文物考古研究院) can be seen working in the tomb in the image at the left. The archaeologists believe that the tomb belongs to Emperor Jiemin (节闵帝) of the Northern Wei (北魏). Emperor Jiemin is sometimes referred to by his personal name Yuan Gong (元恭). The Northern Wei was a Mongolian dynasty and Emperor Jiemin ruled during the years 498-532 AD. Historical sources reveal that after the capital was moved to Luoyang, six Northern Wei emperors died and were buried in the area. Documents specifically mention the tombs of Emperor Xiaowen (孝文帝长陵), Emperor Xuanwu (宣武帝景陵), Emperor Xiaoming (孝明帝定陵) and Emperor Xiaozhuang (孝庄帝静陵). The historical records are not clear in regard to the tombs of Yuan Ye (Prince of Changguang 长广王元晔) and Emperor Jiemin. Because Yuan Ye reigned for only a few months (530-531), the archaeologist do not believe that a tomb of this magnitude could not have been built during his reign. Given the scale of the tomb, its location and configuration, as well as the length of time it would have taken to build, the archaeologists have preliminarily concluded that the tomb must therefore belong to Jiemin. This would be the fifth Northern Wei emperor tomb discovered in Luoyang. The path leading down to the grave is 39.7 meters in length and 2.9 meters in width. The tomb chamber is 19.2 meters in length and 12 meters in width. While a number of artifacts were recovered, many had suffered damage. 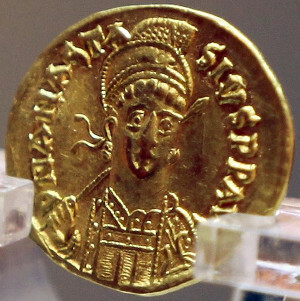 Gold coin found in the tomb of Emperor Jiemin of Northern Wei and minted during the reign of Anastasius I of the Byzantine Empire. However, the most important artifact discovered in the tomb was a gold coin (solidus) in excellent condition. The coin, shown at the left, was minted during the reign of Anastasius I (阿纳斯塔修斯一世) who was the Byzantine Emperor during the period 491-518 AD. The coin is 2.1-2.2 cm in diameter and is one of only a few Byzantine gold coins ever unearthed by archaeologists in China. According to the archaeologists, the discovery of this Byzantine gold coin in a Chinese emperor’s tomb provides further evidence that Luoyang was the eastern terminus of the ancient Silk Road (丝绸之路).